I've said it before and I'll say it again: This building was built to last hundreds of years. Demolition is a failure of imagination, not of the building itself. I would love to see a creative solution that combines floors to make multi-story units, breaks the facade in a sensitive way to modernize the appearance and add space, and/or finds a compatible use within the existing structure. There are other examples of YMCA buildings in Des Moines and better examples of Modernist era architecture in Des Moines, such as Scott Chapel (1955) and the dormitories (1957) at Drake University by master architects Eero and Eliel Saarinen. Even if this were correct (it's not), it still wouldn't mean that the Riverfront YMCA building isn't worth preserving. It's a red herring - perhaps City staff believe that there are a finite number of slots for architecturally significant modernist buildings in Des Moines... and that number is two. Come to think of it, there are better examples of modernist architecture in Europe, why save any of it in the US at all? Much work has been done to preserve the Civic Center National Register Historic District buildings, such as the World Food Prize Center (local landmark), the Municipal Building and the Police Station. The City has encouraged preservation via the Civic Center Historic District and economic development via the construction of the River Walk. Again, so what? Have all of the slots for historic preservation have been used up? The question at hand is this: Is the building significant architecturally and/or historically? If so, then it should have additional consideration. At which point we get to the real "justification" for the staff recommendation. is necessary for the River Walk to achieve its potential. The fundamental error in this statement is the assumption of "balance". Historic preservation is not a "balance" argument at all - as in, "We kept this old building so you get to tear down that one". Historic preservation in urban environments depends on context. The more context that disappears, the less valuable any individual historic building becomes. 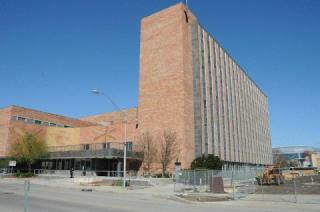 Perhaps a new building on the site of the Y will be beautiful and generate lots of tax revenue! The again, it could be a dud. Who knows? One could make exactly the same argument regarding redevelopment of an existing historic structure. There is absolutely nothing preventing full redevelopment of the historic Y with a better relationship to the Riverwalk. We will likely never know. CJ Stephens made a motion to approve the applicant’s request to designate the “Riverfront YMCA” building located at 101 Locust Street as a Local Landmark. The vote was recorded as 3-8 against, with CJ Stephens, Dann Flaherty and Will Page voting in favor. Greg Jones, John “Jack” Hilmes, Dory Briles, Jann Freed, Christine Pardee, Greg Wattier, Vicki Stogdill, and Tim Fitzgerald voted in opposition.